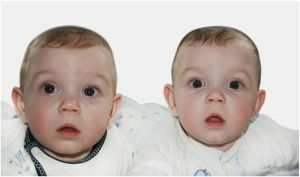 "Our Casting Company is on the the hunt again for twins - newborns - 12 months. From our last submissions at least 4 sets of twins we were able to use on Orange is the New Black, The Leftovers and White Collar! This is great for them to look when they grow up and it also kickstarts their college fund - as all work is paid! Once again we are not and agency we don't collect any fees or commission from any work - we are directly linked to the production company there is no middle man!" twinandbabytalent@gmail.com Subject: Babies & Twins! Have you ever considered teaching twins sign language? Sign language can be taught from birth, and results from signing with twins can be seen from as early as six months of age with consistent use. Sign language has long been one of the ways that new parents teach their babies to express themselves well before they can verbalize their needs and wants. If you have twins, then you know how difficult it can be when both of your children are distressed, and simply do not have the skills to tell you what is wrong. Not to mention, the slower language development that many twins experience. Sign language could help, but it's also fun. Good news for all you soon-to-be Dad's of twins! There's a new online course available that was created with you in mind. In this course, twin fathers and health and productivity experts Ben Greenfield and Ari Meisel give you everything you need for raising healthy and smart twins, including how both mothers and fathers should eat and exercise during a twin pregnancy, how to bulletproof your children’s immune system, twin parent sleeping tips, healthy holistic nutrition for twins, productivity and money-saving hacks, keep yourself healthy and fit while raising twins, creating socially enhanced children, and much more! 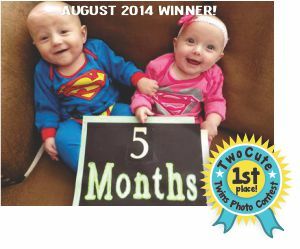 Here's our latest TwoCute™ contest winner!